Ma. Arnie Bordales, said to be a student of Technological Institute of the Philippines, was found dead in a Puerto Galera beach resort. The family is seeking justice for her untimely death. According to a certain Janet Delarosa, Arnie was raped and killed at White Beach, Puerto Galera in Oriental Mindoro province. There were reports that she went missing on January 6 and had drowned, some netizens also said she committed suicide. 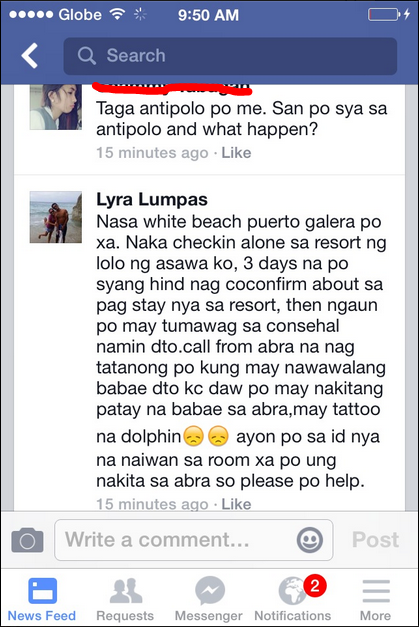 Others relayed that she checked-in "alone" at the resort. Citing barangay councilor Claire Hynson Magtoto, who quoted the police autopsy and report in an interview on January 8, Rizal News Online reported that the victim was declared missing by White Beach Resort staff before she was found lying on the shore. "Sobrang nangitim mukha at puro gasgas dahil inginudngod sa buhangin kaya na-suffocate," Magtoto reportedly said. The "Justice for MA. 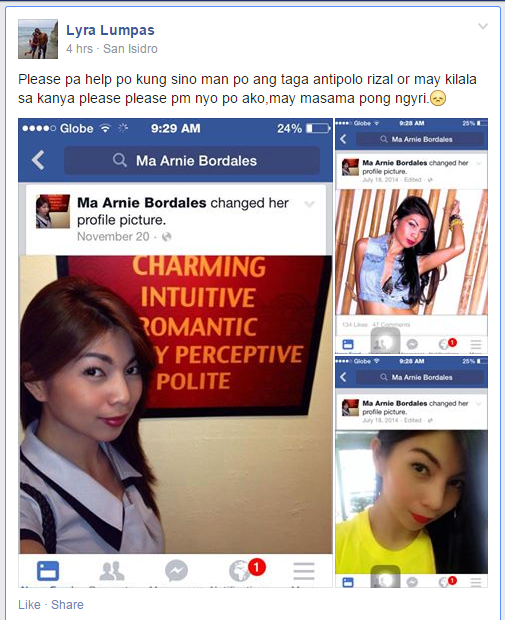 ARNIE Bordales" Facebook page has urged the public to refrain from making speculations, based on the following post dated January 8. HI GUYS, as of the moment please focus on spreading this page to catch attention from the media, we are still trying to coordinate with the family and authorities about the incident, Please stop making speculations that might preempt the investigation and for the security of the family as well, I know all of you are just concerned we will give you detailed information once we got the full consent from the family and legit information from authorities. 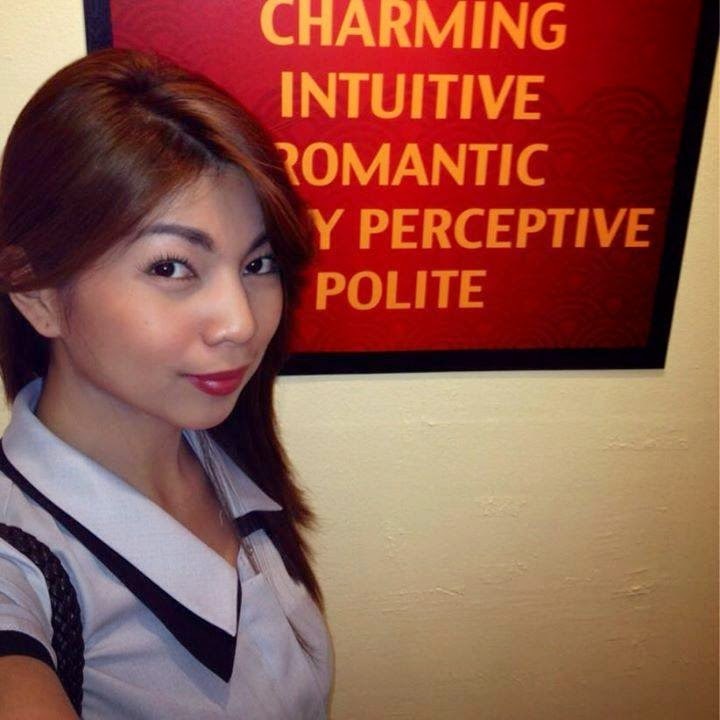 As of now I would like to ask you to please include the family of Arnie on your Prayers and also pray for her soul. Unnecessary comments will be automatically deleted from this page. Let us show some respect as well for the victim and family . To God Be the Glory. The page also posted pictures of Arnie's wake, saying that her remains lie in state at their "original home" located at Napocor, Barangay Mahabang Parang in Angono Rizal. Post by Justice for MA. ARNIE Bordales. A police investigation to established the motive behind the crime is reportedly underway.